Cooking in convection ovens can produce some marvelous results that you just can't get from a standard oven. Standard ovens provide heat, which tends to dry foods and convection ovens retain more moisture. As you might imagine the two do work a little differently so consider these tips when using your new convection oven. Different ovens may vary slightly in design, but most electric ovens have a heating element located at the top or bottom of the oven. These designs rely on radiant heating from the elements and sides of your oven to cook food. Frequently, this design creates cold and hot spots within the oven. Electric convection ovens have an internal fan, which circulates heated air. The hot air is evenly distributed within the oven by the fan, which causes food to heat and brown evenly and more quickly. Convection ovens cook foods in less time than standard ovens. Consequently, depending upon the oven model, size, desired doneness, quantity of food and your cooking temperature, you must make adjustments. Simply drop the temperature by 25 degrees. Alternatively, you can reduce cooking time by 15-30 percent. Monitor foods cooked in smaller ovens carefully. Foods cooked in small sized oven naturally cook faster. Avoid using cushion-air pans designed for conventional ovens. Foods may cook far too quickly and burn. Reduce temperatures by about 30 degrees when using glass baking dishes or dark pans to prevent over browning. Place cooking pans a minimum of one inch apart and allow the same space between oven racks. It's very important to allow consistent airflow throughout the oven when cooking. Make sure baking dishes and trays do not block the fan. Use dishes with low sides, so air flows freely. 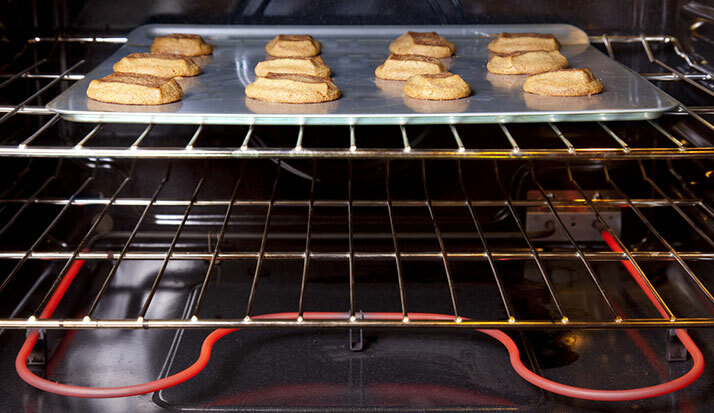 Don't cover oven shelves with foil that blocks air from circulating. You can achieve better cooking results when using several oven racks by using the same size and type of baking pan. Once you learn to adjust cooking temperatures and times, you'll enjoy the benefits of crispier crusts, improved flavors, moister meats and saving on energy bills.